Purchasing a house is a major step for anybody to make. But some people might feel pressure to buy their first house without doing the proper research. You should never make an offer before vetting the opportunity first. After all, this house will hopefully become a home. It's important to be sure of yourself before any major purchase, but especially when considering a place to live. This is one of the most important steps in determining whether a particular house is for you. Doing your own research can yield some important information. This can be done before you even see the house in person. Make sure the neighborhood you want to live in is safe and is close to good schools. Look at other properties in the area as well. How much do houses in your chosen neighborhood typically go for? This will give you a good indication of whether or not you're getting a fair price or not. You should also see if there are any desirable services close by, such as preschools, doctor's offices, grocery stores, and shopping malls. Most people do not have the financial capital to purchase any house they want. Even if you can't afford the gorgeous villa right next to the ocean, there are likely plenty of beautiful houses within your price range. Also, if you're looking to move to another state or country, analyze the feasibility of that move before you make it. Although you may have found the perfect house for your parameters, the hassle of moving is something to be weary of. Moving can also be expensive. Any money you might save on a new house wouldn't matter if you were going to spend that money on getting there. Once you’ve made the decision to purchase a home, I recommend you get pre-approved for a home loan as soon as possible. A pre-approval letter is much stronger than a pre-qualification letter from a lender. It means you have actually started the loan process and are in a position to close faster. In addition, you have already been disclosed your costs and fees so there should be no surprises at closing. It demonstrates to both you (and to sellers) how much house you can afford. Realtors also prefer that you have a pre-approval letter before they start showing houses so they know the price range you have qualified for. And, in the event you’re competing with multiple offers on your dream home, most sellers will consider offers with pre-qualification letters before those without. It is crucial to see your future home in person before you sign anything or give the seller any money. Scammers are everywhere, and it's usually not a good idea to buy anything before knowing it will be handed over exactly as advertised. Some people may be faced with a building owner that pressures you to sell, even if you haven't seen the place in person. This is a red flag and may result in you being bilked out of your money. If you feel comfortable signing a contract without seeing the house first, make sure you do so under the consultation of a lawyer. They may be able to help you add clauses to your contract that would help you in the event that all was not as it seemed. For example, a lawyer could help you add in a clause that specifically lays out the condition the house needs to be in in order for the offer to be valid. If a building owner does not deliver, the contract is not valid and you do not lose out on any money. Some people are comfortable house searching by themselves. This is made even more possible by the various internet tools available. But it can always be useful to consult an expert. Realtors are available to assist your search and can provide you with valuable insider information. They are market experts that will tell you whether or not you're getting a good deal on your prospective home. Realtors will also help ensure that you're compliant with all local and state regulations and that you're operating inside the law. Along those lines, lawyers can be your first line of defense against legal missteps and fraud. Consider hiring an attorney to outline the legal consequences for a seller if your requests are not met. Lastly, never make an offer for a house that has not been inspected. Oftentimes, the inspector is hired by the seller or the real estate agency managing the transactions. But if for some reason, you do not trust the judgment of those people, you can always hire your own inspector. Getting an inspection before moving in is important because it's the only way you will know if your house is safe and structurally sound. Some houses, especially old ones, have gone through years of stress and may not be safe to live in, even though they look okay superficially. These houses may also contain a dangerous chemical substance such as asbestos, and could potentially be harmful to you and your family. There are many people that can help you during the house hunting process, so don't be afraid to ask. Once you've done the appropriate amount of preparation, it's time to sign on the dotted line. Be sure that all verbally agreed upon terms are clearly laid out in your contract. For example, if you and the seller have arranged alternative payment terms, make sure that is communicated in the contract. Otherwise, those terms will not be legally binding and nobody will be obligated to stick to them, even after you make an offer. The offer should also include information on utility bills, such as gas, water, and electricity. A signature on an offer implies that the buyer agrees to pay those bills on time. Furthermore, an offer may include specific provisions that had likely been discussed earlier in the process. These provisions might include payment contingencies and maintenance information. It's common for offers to have a detail explaining that their offer will be rescinded if an agreed upon time limit expires or the house fails an inspection. Once you make an offer, cross your fingers! If you've covered all your bases, you may be just days away from moving into your dream home. 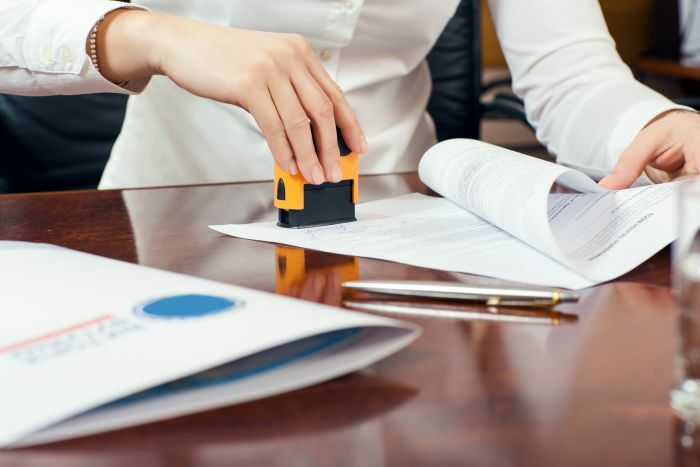 If you are signing any major, legally binding document, it's likely that you will be seeking the services of a notary to make sure that your documents are valid. Notary Depot is the best place to conduct your notary search and get that much closer to owning your own house.